Want to can your own grape jelly or make your own wine? There’s a grape out there for you. There are literally thousands of grape varieties available, but only a few dozen are grown to any extent with less than 20 making up the entire world’s production. What are some of the more common grape varieties and some characteristics of the different types of grapes? Grapevine varieties are divided into table grapes and wine grapes. This means that table grapes are primarily used for eating and preserving while wine grapes are for, you guessed it, wine. Some varieties of grapes can be used for both. American grapevine varieties and hybrids are generally grown as table grapes and for juicing and canning. They are also the most common varieties of grapes for the home gardener. These wild grapes are important food sources for wildlife and are often found in moist, fertile forest soil near streams, ponds and roadsides. Most of the modern varieties of table and wine grapes are derived from one or more species of wild grape. 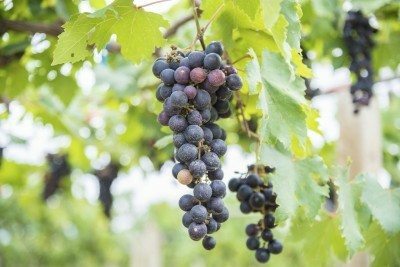 There may be several different types of grapes suited to grow in your garden, depending upon your climatic region. Warm regions with hot, dry days and cool, humid nights are ideal for growing wine grapes, Vitis vinifera. Those folks in cooler regions can plant a variety of table grape or wild grape. Concord probably rings a bell, as it is a common table grape often made into jelly. Niagra is a white grape that is also delicious eaten off the vine. Canadice, Catawba, Muscadine, Steuben, Bluebell, Himrod and Vanessa are also popular table grapes. There are many other varietals of both table and wine grapes, each with a unique characteristic. A good nursery will be able to direct you as to which varietals are suitable for your region.